I've come back down to earth, from gazing up into the sky, to show you some photographs taken in my home. A week ago Krystle challenged us to take photographs of our tatting spaces etc., well I’ve been a bit slow on this, but at last I’ve managed to get the camera out and shoot a few pictures. Last weekend I visited my sister and I can report that she is now packed for her Palmetto teaching, I did peek into one of her bags as we sat for half an hour out in the garden, but that’s all I'm going to report! Those of you who are attending these "tat days" will have to wait and see what other surprises she has, not up her sleeve, but on her shuttles! So here is where my tatting is stored and where I mainly work. 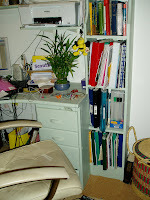 It’s a room that is also a study, a tatting room, sewing room and computer room and so it also contains files and books for my church work, scouting, family history etc and because of this it tends to get into a mess very quickly as I leap from one thing to another, often without putting everything away! 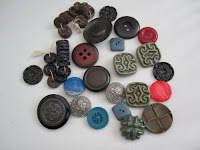 You will also notice a sewing chest, which was especially made when we lived in Hong Kong, this contains sewing cottons, buttons, beads and countless other bits and bobs associated with handicrafts. It doesn’t contain my tatting threads these are stored in plastic boxes, as you can see by the chest, and are supposed to be neatly stored in a cupboard but they keep escaping! 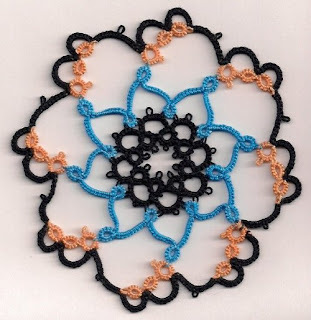 Whenever I start a new tatting project I'm amazed how a small piece of work can generate such chaos as I search for a pattern, suitable thread, beads etc. at this stage everything has been removed from cupboards, drawers and shelves. 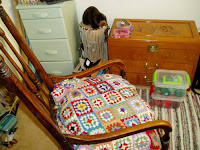 It's time to tidy up this particular tat corner, so wish me luck as I find stray beads, tackled thread and oh ouch a needle in a place it shouldn't be! Well I just had to complete the trio by tatting a star, especially after such an eventful week for those who are interested in the sky above. It has been said that counting all the stars in the Universe would be like trying to count all the grains of sand on all the beaches in the world, an impossible task. Instead scientists can only estimate how many stars there are in a galaxy. Apparently most of the stars we see in the sky are 250 light years away, I can tell you that this star felt like it was going to take me light years to make, and it travelled 250 land miles or more in the attempt! But thats another story. This year the world celebrates the International Year of Astronomy, marking the 400th anniversary of the first drawings of celestial objects through a telescope. 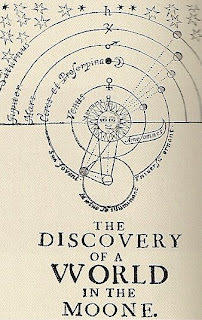 This first has long been attributed to Galileo Galilei, the Italian who went on to play a leading role in the 17th century scientific revolution. 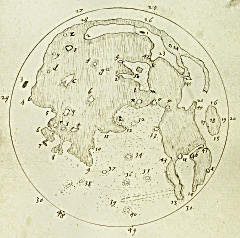 But astronomers and historians in the UK are keen to promote a lesser-known figure, English polymath Thomas Harriot, who made the first drawing of the Moon through a telescope several months earlier in July 1609. Above is one of his drawings, yesterday 26th July he was remembered for this achievement. But in England the sky last night was covered in dark clouds and rain so no stars could be seen, not even the moon and we are still awaiting the sun! Since the mists of time people have made up stories about the sun, the moon and the stars in that heavenly vault in the sky, and they still do. These actors who move around the sky are mysterious and enchanting even with the advent of space exploration their fascination has not diminished. It has become quite an eventful week for those who have been looking up into the sky. The 40th anniversary of the first man to walk on the moon on Monday and today the longest total solar eclipse this century over Asia, with large areas of India and China plunged into darkness. This eclipse lasted six minutes and 39 seconds at its maximum point. Did anyone reading this and living in that area witness it? The next total solar eclipse will occur on 11 July, 2010. It will be visible in a narrow corridor over the southern hemisphere, from the southern Pacific Ocean to Argentina. The oldest and most basic feature about the concept of heaven is that it is above the earth, where God lives, heaven above and earth below, this is certainly what many passages in the bible lead us to believe. 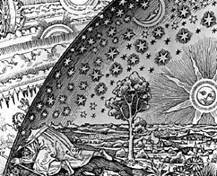 But of course we now know more about the universe, and about the omnipotence of God. The sky and its inhabitants still holds a romanticism which hopefully will never diminish, it is creation at its best and most glorious. Hope you enjoy this tatted sun from the same pattern as the moon, we could do with seeing a little bit more of it in England at the moment instead of the rain! I’ve tatted my sister’s moon taken from her mobile pattern which is here, this is to celebrate the first time man walked on the moon 40 yrs ago tomorrow when American astronaut Neil Armstrong climbed down from the space craft and put his left foot on the surface of the moon and said these now famous words "That's one small step for man, one giant leap for mankind". A common saying is “Once in a Blue Moon” meaning something doesn’t happen very often, a rare occurrence. But what is a Blue Moon? According to the popular definition, it is the second Full Moon to occur in a single calendar month. On average, there will be 41 months that have two full moons in every century. By that calculation 'once in a blue moon' means once every two-and-a-half years. However, there are rare examples of the moon actually appearing blue, after a volcanic eruption or unusual weather conditions. However, Neil Armstrong said that the moon was grey so perhaps we should believe him! For those of you who are old enough to remember, oh yes and that does include me! What were you doing 40 years when man first walked on the moon? I work in four churches, three of the churches have lovely stained glass windows. One church goes back a thousand years, and the other two were built in the Victorian times. The fourth church was built in the 1960's and from the outside doesn't look remotely like a place of worship! It also doesn't have any stained glass windows. I was really impressed at seeing these stained glass pendants, tatted by yarnplayer (sorry I don't have a name), because they did indeed remind me of church windows , the stained glass affect was beautiful. Then I found this pattern on Heather’s site and sort of adapted it, the motif is what I came up with. 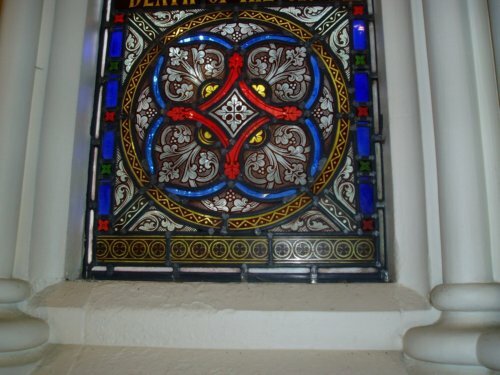 I know it doesn't look much like the small piece of stained glass window in the picture, which is from one of the Victorian churches, but its a start and with a little more work I’m sure a better resemblance can be made. Another project for the future! 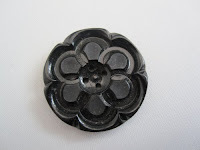 I've alway been fascinated by buttons and continue to be, these came out of the tins I was given here and I've been meaning to show you them for ages. I've no idea what to use them for as some of them are a quite large and bulky, they are also in many respects unusual. I can't use them for holding earrings as Gina suggests because I don't have pierced ears. 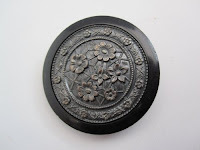 The two large black ones may be useful as a brooches though. Sadly there hasn't been much time for tatting over the last few days, and spending the evening stuck in the office with a computer, a former Vicar of the Parish, and his Curate trying to sort out computer problems, wasn't fun. No honestly it wasn't! Especially as this morning the new printer decided that it wouldn't print a thing! Most unhelpful when I needed to get a weekly church information news sheet out to the four churches, so it meant going home and starting again on my own PC. 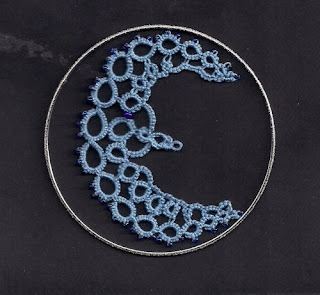 The result is far from satisfactory and I've wasted hours of tatting time! Sometimes I hate technology, give me a shuttle any day!! I've seen many blogs where tatters have mislaid patterns, and yes I've done that also. This time though I just can't find a particular ball of cotton, where has it gone? I have started a project and it was one of the colours that was part of a design and now I can't find this particular coloured cotton. I've looked absolutely everywhere, even tidied up whilst searching, which isn't a bad thing. 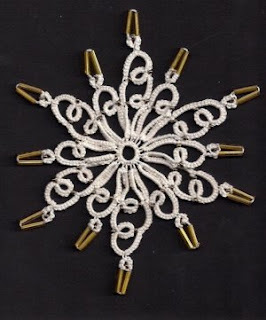 Its strange how tatting and all the equipment that goes with it spreads around the place. I was talking to my sister Jane on Saturday and she said she even gets beads stuck underneath the keys on her computer keyboard! Anyway I've abandoned the project and decided to start something else in the hope that the cotton will turn up when I'm not expecting it. Meanwhile I am showing you the lovely birthday present I received from my son and his girlfriend in Singapore, with a very distinctive clue to the company that designed them. 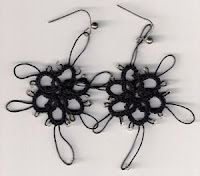 The tatted earrings are some I made years ago when I was experimenting with my own patterns, before I learnt techniques like SR and SCMRs. They look a little bit like spiders! 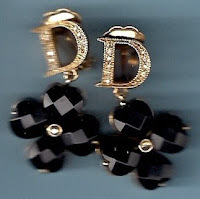 I don't have pierced ears so they have never been worn, must give them to someone who possibly would like to wear them. Thats me! It's my birthday today and you folks over in America are celebrating it with lots of lovely food and fireworks, thank you! I hope you are having a lovely American Independence Day. I tatted Martha's butterfly angel today, mainly because it is quick and easy to tat, well in theory, in practice it took me three attempts because I got myself in a muddle. The main reason for this was that I worked on it for five minutes and then put it down to go and do something else. 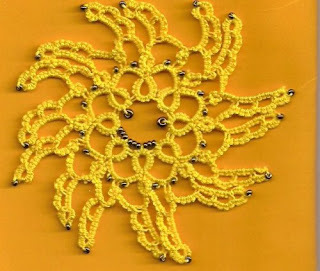 I never think it is a good idea to put tatting down in the middle of a pattern, unless you know it off by heart. I've received some lovely birthday presents including one from Singapore which I will blog another day. The one you see today is an angel an Irish angel. 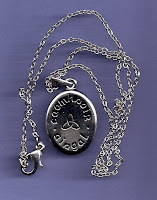 My friend brought it back from the Emerald Isle, the necklace is made of pewter and it is called a Guardian Angel and you will see this written on the back, well of course thats if you can read Irish!